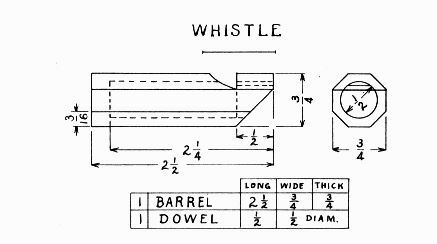 The size of the chamber, of the notch, of the inlet for air, the force with which air is blown in,—these are some of the conditions which affect the tone of a whistle. Plane a piece of close-grained wood 6" × 3/4" × 3/4". This length is suggested so that two trials at boring can be made. Bore a 1/2" hole 2-1/4" deep. To help in boring this straight, clamp a straight-edge (the ruler may do) in the vise together with the square stick. Have one edge of the straight-edge on the center of one side of the stick. After boring a straight hole, draw pencil lines 3/16" from the long edges on all four sides. A good way to draw such lines is to rest the middle finger-nail on a side of the stick as a guide and hold the pencil closely over this nail while sliding it along. The hand must be held rather rigid. Practice will enable one to draw lines quite accurately this way. Place the stick in the vise so that one edge is straight up, and plane the corner off to the line. Plane all four corners so as to make a good octagonal stick. 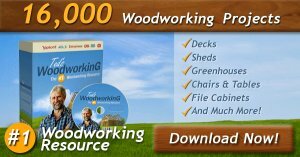 Sticks that are planed nearly to size can be made round and smooth by driving them thru a hole in a block of hard wood or iron; such sticks are called dowels. Two holes may be used if the second is only a little smaller than the first. Drive gently with a mallet rather than with a hammer. In many of the models in this book such dowels are used. Dowels (made by a different process, however,) can often be bought at hardware stores. Make a dowel (see above) about 1-1/2" long to fit nicely in the hole. Do not crowd it so hard as to split the whistle. It might well be fitted first in a 1/2" hole bored in a waste piece of wood. Plane off a side of this dowel till a flat place is made 3/8" wide. Push the dowel into the whistle and saw the straight end of the notch about 3/16" deep. Pare the rest of the notch with knife or chisel, testing the whistle by blowing it occasionally as the paring proceeds. When it sounds best, glue the dowel in place and allow it to dry before sawing it off and cutting the slanting part. When this is done saw the whistle to a length of 2-1/2". If a rolling sound is desired, put in a pea before gluing the dowel in place.